I thought about changing my own oil the other day, but I then realized that it is not worth my time. After many years and several mistakes later, I now understand where my strengths lie. I’m no auto mechanic. I am not good at carpentry or electrical work either, and if a plumbing job around my house requires more than a quick jiggle of the toilet handle, I’m lost there as well. There are many times though when I am tempted to try my hand at what is supposed to be a simple task like changing my own oil in my car, but then I run a quick cost benefit analysis in my head. It’s just not worth my time. I make approximately $71,100 per year before taxes or $62,400 after taxes (a lot of my income is not taxable because I work for the government). That equals $5,200 a month, $1,300 a week, or $185 every day. Let’s just pretend that I work a 40 hour work week even though that’s not true for most of us, including me most weeks. But, for the ease of calculations, let’s just pretend that I work 40 hours per week. That means that I make about $23 an hour. It costs $19.95 to get my oil changed at my local quick lube shop, and it takes them about 15 minutes. They even have big signs out front touting how fast they can get the job done. I, on the other hand, know nothing about cars. I can probably change a flat tire if I was really desperate, but I absolutely do not and cannot change my own oil and oil filter. My best friend and I tried to change the oil on my 1990 Oldsmobile once when we were teenagers, but after two hours of monkeying around and a quart of oil spilled on his parents’ driveway, our days of being automobile mechanics was over. His parents were so mad at us, but we had a great time. We thought that we were slick driving my hand-me-down car up onto the wheel ramps that I borrowed from my dad. I ended up driving too far, too fast and almost crashed my car into my friend’s garage. Because it took me and my best friend two hours to finish the job, you could calculate that it cost us $46 worth of our time and that is only counting my salary. It cost us a lot more in time if you add my friend’s salary with mine. We saved $10 in parts, but it cost us $46 in our own labor. I know that this example is fairly simple and set in the past, but the same would have been true had we done the work yesterday as well. It still would have taken us hours to finish the job. There is an opportunity cost in completing any task. The amount of money that you spend on any undertaking is money that cannot be put to work in a more productive fashion. Are you getting your money’s worth from your time? If you work for a set hourly wage, you know how much your time is worth. But, have you ever calculated how much your time is worth if you are on salary like I am? It could be well worth your time to know your break even opportunity cost for doing any menial task. If you could better spend your time, money, and energy making money, maybe you should outsource some of these tasks. Another example might be a real estate investor who spends his time fixing up his rental property instead of hiring a property manager. Sure a manager eats into your profits, but wouldn’t it be a better use of your time looking for new real estate deals that could earn you tens of thousands of dollars instead of fixing a clogged drain? Do yourself a favor and do not waste your time being inefficient. It is counterproductive to save pennies when you spend several dollars for the right to save those few cents. 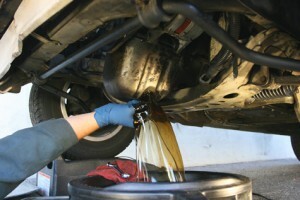 I used to change my own oil until it became difficult to recycle the used motor oil. I would have to call around several shops and they would all tell me they were full of used motor oil. Kind of defeated the purpose if I couldn’t safely discard of the used oil. I actually enjoyed changing my own oil and it only took about 30 minutes, but disposing of it became a major time waste and made more sense to go to the dealer. They always offer coupons and I can get it done for under $30. I read somewhere that the best way to make money is to do exactly what you are saying – by focusing on where you add the most value and by outsourcing the small tasks. The thing about changing the oil in your car is that in all likelihood it took you longer than two hours to do it as you had to get the ramps off your dad and drive over to your friends house and you would have spent time thinking about how exactly you were going to do it. This excludes the actual two hours you spent changing the oil. Outsourcing is key. At the moment our dishwasher is broken. We have to wash the dishes by hand. Now washing dishes isn’t the most productive use of my time and I spend a good hour every evening washing and drying the dishes. From this simple task I can see that the people who make the real money are those clever enough to realize what they are good at and spend most of their time doing it. As other posts indicated, some people actually enjoy changing their own oil!!! Check wih your city recycling center because many take used motor oil, simply because they dont’ want it being dumped out down the drain or in your yard. If they don’t take used old, lobby to have them take it as many cities do take oil from citizens.